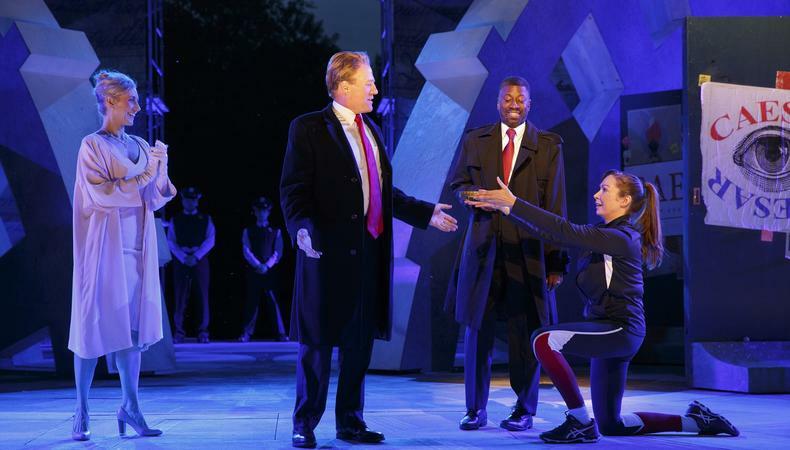 Last week, The Public’s Free Shakespeare in the Park, returned to the Delacorte Theater in Central Park with a production of “Julius Caesar” (through June 18). As with most of Shakespeare’s work, the show’s themes are universal and timeless: greed, power, politics. And as enduring as these themes are, they seem particularly pertinent these days given the current political climate, a thought that occurred to Oskar Eustis, artistic director of the Public Theater and the play’s director, on Nov. 8, 2017. So I think the show, I think [Oskar’s] done a great job with bringing it into the present day and showing how it relates to our situation. And it’s just a great honor to be a part of it and to be able to do something with my art at this highly political time that might have some meaning to people who see it. What’s it like playing a Caesar given the current political climate? I hope that my approach is fearless. I think that’s the intent of Oskar’s production as well. I think the correlations between Julius Caesar and our current president are, you know, not exact in many many many ways. Julius Caesar was a general of great import in the world and an innovator and a great leader in many ways. But he became drunk with ego, drunk with power, drunk with ambition and the belief that he and he alone must rule the world. So you can take from our present politics and president certain things he said in the campaign and certain things he said since he’s been in office in terms of his outlook and in terms of his philosophy if you will. For instance, his mention of “I’m the only person who can do it,” which he said several times during the campaign. And so the idea for me was to try and do some things that will represent and show you—and I have great costumes and wigs that show you that this could be Trump. But I’m also trying to bring in the larger knowledge of tyrants. It’s sort of a “tyrant's’ greatest hits” in [the way I play] the speeches and in the nature of the ego and belief that one man is more important, is above the law, is the law. Those tyrannical beliefs in terms of how to deal with power. Hopefully, I’m able to sort of show what’s happening with this president, tweak this president for kind of what he is in a lot of ways and also show the dangers of dealing with a tyrant or possible tyrant in our country. What experience do you have performing Shakespeare? I did quite a bit of Shakespeare as a young actor. I trained at the University of Washington Seattle and after school, I went down to the Old Globe in San Diego and did “As You Like It” and “Othello” and “Troilus and Cressida” down there, and “Henry IV” at the Denver Center a couple years later. But it’s been awhile since I’ve done Shakespeare! Did you audition for the role? Actually, Oskar called me up and asked if I was interested. He wanted me to do the role but he wasn’t sure about my Shakespeare because I hadn’t done any since I was like, 26. So I put a couple scenes on tape for him which he then approved. Then we met in San Francisco and talked about the role and what his ideas were. And then we decided to do it! Did you prep for this role differently than the other kind of work—scripted series, film—you typically do? Preparing for this role, you read a lot of history, you read a lot about Julius Caesar. You read modern people writing about history and also all the back to Plutarch just to get a sense of who he actually was and who he is in the course of how Shakespeare sees him. And then of course, how we’re gonna see him through Oskar’s production and how to fit the puzzle together of those various things: a bit of today’s politics without totally losing the sense of the man. Do you find there’s still room for collaboration and new ideas in a show that was written centuries ago? That’s the beauty...whether the play has been done a thousand times or it’s new, it’s always what you bring with your instrument and your imagination to the part, so it’s always new. You’re basically developing it from your artistic sensibility along with the director and the production. So it’s the same in the way that you invest your creativity in your part. You can watch other films [and productions] of “Julius Caesar” and see what they did and see whether it’s worth stealing or not! [laughs] Which is true of all art—you take things and you make them your own. What Shakespeare play should every actor perform in? I guess my favorites are “Hamlet” and “Othello.” I performed [“Othello”] in college—I played Cassio and would love to play Iago someday—[my professor] was kind of obsessed with his theory on the play so I was indoctrinated into loving that play early on. But I love some of the comedies: I love “Much Ado,” “Midsummer's,” and I think all actors have a lot to learn by reading and doing Shakespeare’s plays. They’re always a constant education as you work in the process of rehearsal and then as you work in the process of performing them. What advice do you have for early-career actors looking to perform Shakespeare professionally? For young actors to perform in anything is the key. Performing Shakespeare, you can sort of limit your search if you will to the various festivals around the country and people who dedicate their theatrical seasons to Shakespeare. I was reading, I think it was Don Cheadle’s Twitter and a young actor was asking about not being able to afford to take acting classes and what can they do, and he suggested—and I think this is great—is to get together with other young actors and you just get in someone’s apartment and you read the plays. And in reading them...you learn how to speak in a way that’s not the way you speak. You learn how the words can affect you. You learn where the words can take you. Joss Whedon, who did a great “Much Ado About Nothing” film, he had a group of actors who he would meet every weekend and they would just read Shakespeare plays. That was something they did for enjoyment. And I think it’s important for young actors to always take plays, read plays, and try to do plays as much as you can in any circumstance. What advice would I give my younger self? Oh gosh. I don’t know! You know, show business isn’t easy and it’s a confusing roadmap, and it’s hard to know which road to take sometimes. So think about each decision. I might have made decisions in haste [laughs] or in the impetuousness of my youth. And those can have a ripple effect. But the main thing I was blessed with—and I think every young actor who pursues [acting] has to have—is that I love it. You have to in order to deal with all the potholes in all those roads. So my advice to my young self: Don’t sell yourself short. Have you used Backstage in the past? Ready for your shot at Caesar? Check out Backstage’s theater audition listings! Allie is Backstage’s digital managing editor and project manager, whose professional background includes women’s interest, news, health, beauty, and, of course, entertainment. Despite a crippling fear of singing in public, she still believes she’ll be a Broadway star one day.